On his return from the Climate Change Conference in Lima, earlier this month, Climate Change Minister, Hon. Tim Groser claimed that New Zealand was in a difficult position because it had “no low hanging fruit” for reducing greenhouse gas emissions (interview on Morning Report). Many would disagree with this claim, certainly regarding net emissions. And many of these dissenters will be foresters. It is generally acknowledged that New Zealand needs more forest and woody vegetative cover to offset another of our serious environmental problems, namely soil erosion. This is seen in programmes such as the East Coast Forestry Programme, the Horizons SLUI project and the Government’s Hill Country Erosion Fund. LandCare Research has estimated that there is close to one million hectares of hill country that still needs forest or some form of tree or shrub cover to mitigate accelerated soil erosion which is stripping topsoil (more than 30 million tonnes per year) and clogging many of our rivers. But tree planting on this highly erodible country also offers the chance for major carbon sequestration, and thus reduced net emissions, from this land. A million hectares of average productivity radiata pine could offset at least 90% of total agricultural emissions for 30-40 years. I would dread the thought of all this land being planted in radiata pine but a combination of pine, other production species, native regeneration, spaced plantings of poplars, etc. could still offer major carbon sequestration while tackling this other problem of accelerated soil erosion. In theory the Emissions Trading Scheme should be able to achieve these ends, but the present Government has gutted the ETS and destroyed any confidence that it can be relied on to assist forestry. New forest plantings have dropped to their lowest levels in 50 years since the introduction of the ETS in 2008 and net planted, forest area has reduced by 3% since 2003. The ETS seems to have had the opposite effect to what was intended. We need other mechanisms. Carbon sinks are, of course, only temporary measures and will eventually fill. However by using the wood from forests for structural use through to energy, the country could permanently reduce its carbon footprint. There are a number of exciting, new wood technologies that are allowing construction of innovative, multi-story, wooden buildings, though depressingly few of these are in New Zealand. There will also be people who would question the commercial wisdom of turning more sheep and cattle pastoral land into forest. But the statistics show that average, commercial forestry generates twice the export earnings per hectare of average sheep and beef land. Over the period 2008-12 forestry generated, on average $2,144 of export earnings per hectare (fob value of forest products) compared to approx. $1100 per hectare of export earnings from sheep and beef (fob value of all meat products plus wool though woollen products can be difficult to identify). Dairy was comfortably ahead at over $5,000/ha. At the on-farm level commercial decision making tends to be distorted by our excessively high land prices, which ensure average returns of less than 3% for sheep and beef farming. This ensures short term thinking and a need to generate quick cash, rather than the longer term profitability of forestry. In addition, access problems and costs of logging can undermine returns on some sites, especially for small blocks. Still, a recent study of 84 woodlot sales showed average returns of over $20,000 per hectare representing around $700-1,000 per hectare per year. Compared to average gross margins of around $100 per stock unit for sheep and beef, and assuming the owners, quite rationally, put the trees on their poorer land with perhaps 5 stock units per ha. carrying capacity, this represents a good return. For quite a few of us, forestry on our poorer land is generally more profitable than livestock on our better land. So contrary to Mr Groser’s claims, I see a lot of “low hanging fruit” in our climate change response. And what’s more it’s low hanging fruit that offers a win, win, win option. I would regard it as too good to turn down. 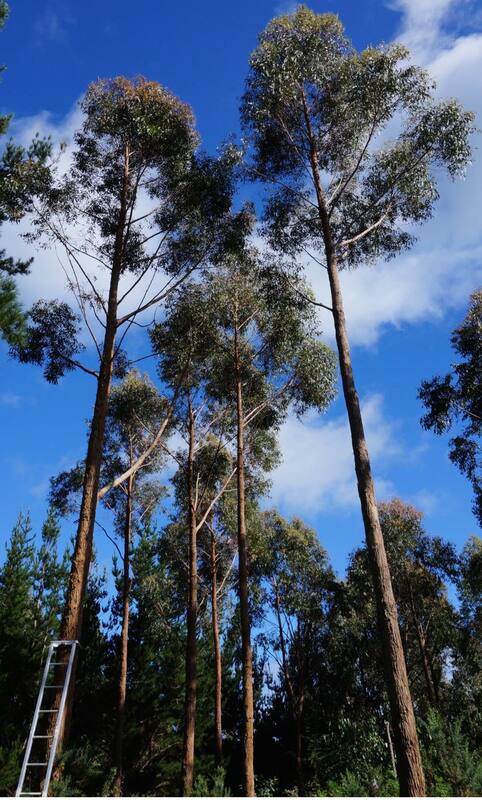 Eucalyptus sphaerocarpa is a class 1 durable eucalypt species that I introduced into New Zealand in the mid-1990's. I was looking for a highly durable species from the monocalyptus group of eucalypts, which have shown to have good levels of resistence to insects in New Zealand. E. sphaerocarpa is a large tree from the Blackdown tablelands in Southern Queensland and grows at about 1000 m altitude. It's called Blackdown stringybark, although actually an ash eucalypt rather than a true stringybark. The timber is highly prized in this area. Mike Wilcox, renowned botanist and eucalypt enthusiast, saw the species in its native habitat and described them to me as "huge magnificent trees, a sight to behold". So why do I like it so much? 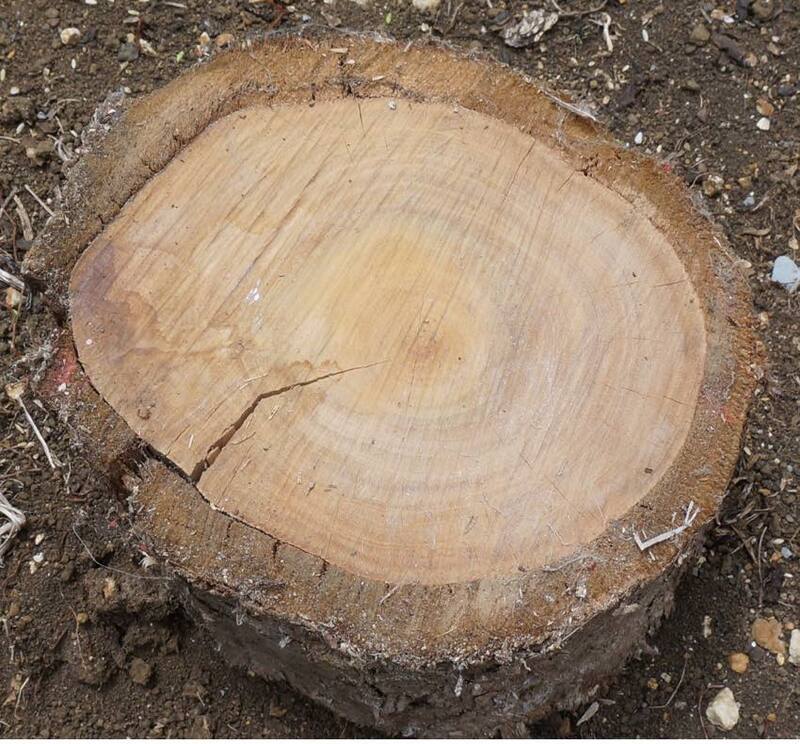 It is disease and pest resistent, grows extremely straight and has a very high content of durable heartwood. What more could I ask for... the "silver bullet" from over 20 years of durable eucalypt species trialwork. Is there a market for ground durable untreated posts and poles in New Zealand? Is it viable to be production thinning 10 year old trees for naturally durable posts, then growing the remaining trees to 25 years for a high quality class 1 durable hardwood decking product that will last 40+ years in service? 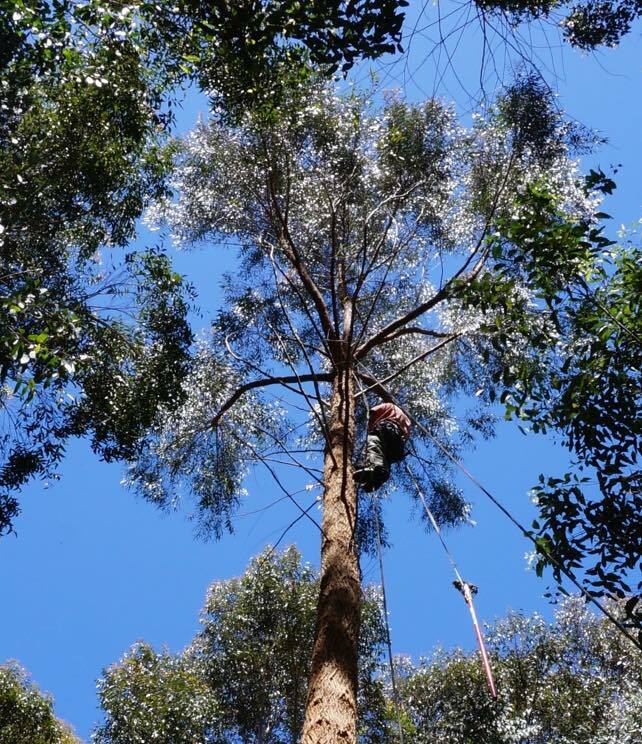 Can we grow durable eucalypts with just standard practice lift pruning and thinning... without any form pruning? I beleive yes to all questions above. However, we need the right species. In my view the only species that might fit the bill are E. cladocalyx and E. sphaerocarpa. Sugar gum (E. cladocalyx) is a woodland species and has a very open crown. Great for dryland climates where we wouldn't expect much in terms of sawlog volume per hectare. Species with good crown density like E. microcorys (tallowwood) and E. sphaerocarpa can be held at a high final crop stocking and still produce good diameters, thus a high volume per hectare at harvest. Siting tallowwood isn't so easy... wonderful class 1 durable timber but the species has an unstable crown that smashes in high winds, and the species is very frost tender. What about siting E. sphaerocarpa? My trees were planted on a windy ridgetop in Northland, on low fertility clay soil. They have thrived. Not sure about frost hardiness but I'm working on it and have planted trees in a range of localities throughout New Zealand. The expectation is for medium frost hardiness. Anybody interested in planting this species should get in touch with the NZFFA Eucalyptus Action Group, we are looking for volunteer sites and growers willing to trial durable stringybark eucalypts. E. sphaerocarpa plantation in Northland. Pruned stand showing excellent form. These trees have not been thinned and were planted at a low stocking. There was no form pruning. 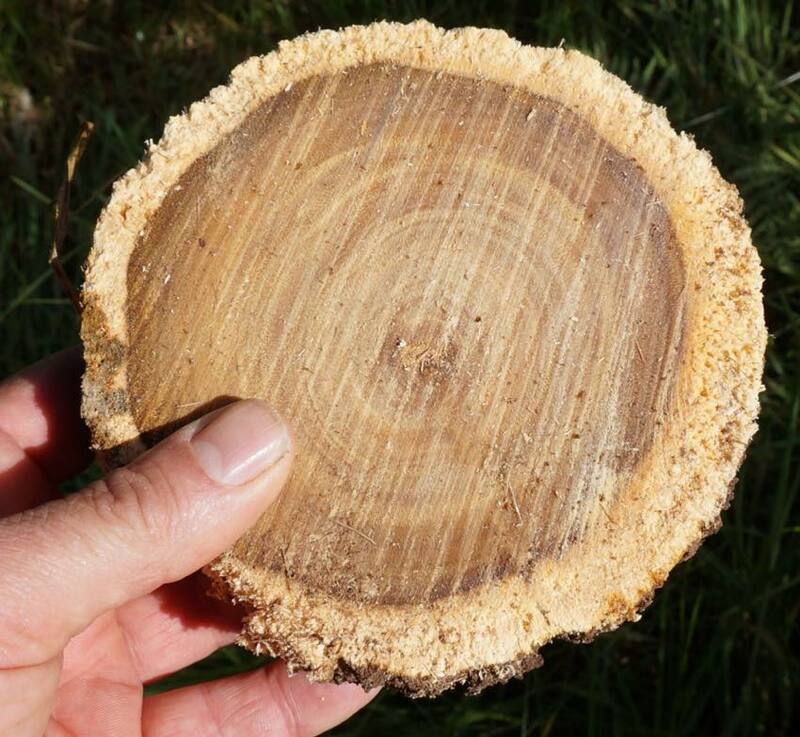 Cross section at 4m from a tree that blew down in a storm at age 10. Five years on the ground and the sapwood has rotted away. Note the high heartwood content. I'd be interested in measuring the density of this "young" material, it certainly feels very heavy. At 20m this tree is forming a crown. It is pruned to 15m. Comparison between 10 year old E. sphaerocarpa (in front) and 10 year old E. muelleriana (behind), both blew over in a storm 5 years ago. 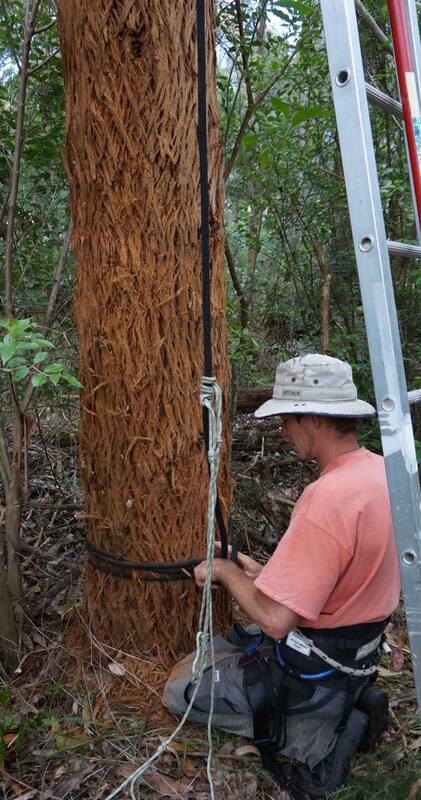 E. muelleriana (yellow stringybark) grows a bit faster but is not as durable and has a bit more sapwood. Both are monocalypts and put on early heart. E. muelleriana has timber similar to E. pilularis (blackbutt), pale yellow/brown whereas E. sphaerocarpa has brown timber. For comparison, here is 10 year old E. bosistoana (coast grey box). This is a class 1 durable species and being in the symphyomyrtus group it puts on heartwood slowly. I don't beleive there is any heartwood to speak of and if there is any it certainly isn't clearly defined. This species also has poor stem form, suffers multiple leaders and is not at the top of my list. 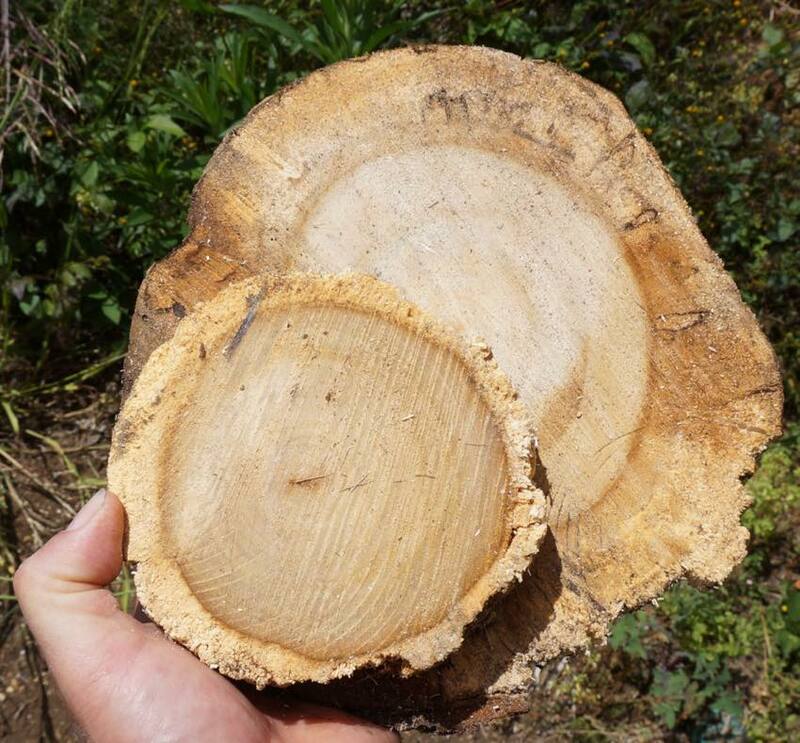 Here is wood from 10 year old E. quadrangulata (white-topped box), another durable symphyomyrtus species. 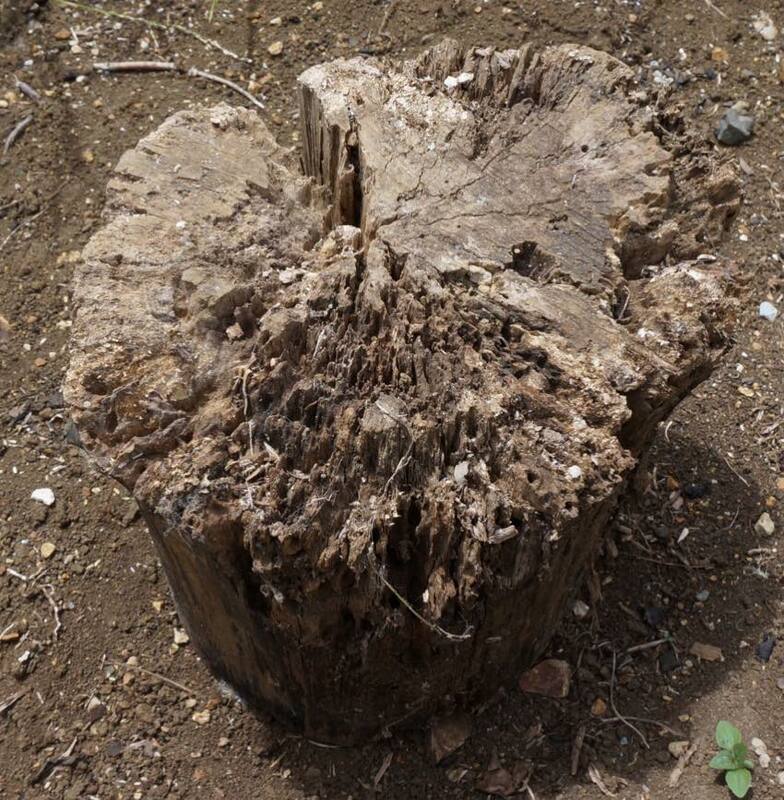 The base of the tree was cut and appeared to have some heartwood. This was placed on the ground outdoors to test durability. The wood was perishable to the core, with no "real" heartwood present at this age. Although very fast growing in the early years, E. quadrangulata suffers from insect damage and resulting multiple leaders. These trees were planted at final crop stocking and were not thinned, demonstrating the good form and potential of the species for deployment into productive forestry plantations.